[Updated 10/6/17, 8:09 am. See below.] 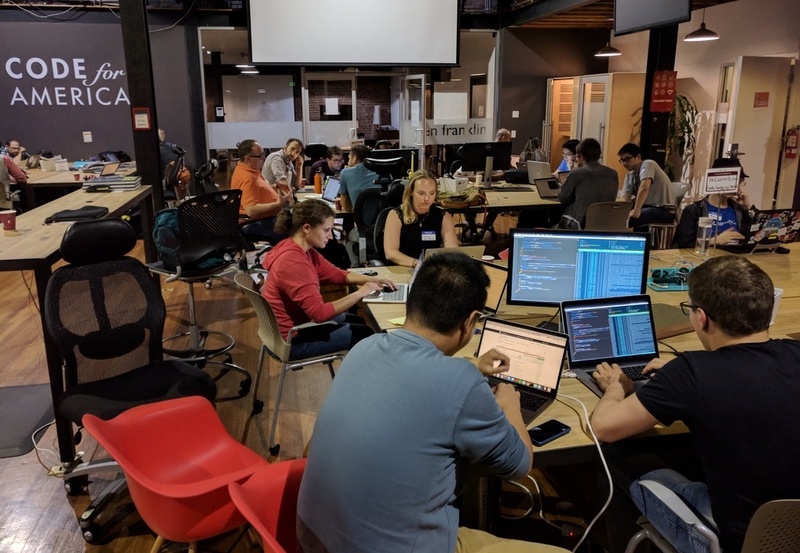 Houston—As Hurricane Harvey whirled toward the Texas Gulf Coast, a volunteer group of techies in Texas and other parts of the country gathered in a Slack channel to develop tools that could help with rescue, recovery, and relief efforts. Nearly six weeks later, that group of volunteers—with some coming in and some leaving—has continued its efforts to create application programming interfaces (APIs), websites, textbots, and other tools, shifting focus to Florida and the Caribbean as Hurricanes Irma and Maria made landfall. In particular, he’d like to know what happened to the FEMA Tech Corps program, which was designed to recruit companies to help communities set up tech and communications infrastructure in the event of an emergency. Unveiled two years ago, the program was intended to create “a nationwide network of skilled, trained technology volunteers who can address critical technology gaps during a disaster,” according to a 2015 press release that described the program. Underwood said he thinks that a federal program featuring top names in corporate tech could provide much-needed resources to the freelance “gig economy” developers at the front lines of disaster relief efforts. “Don’t you think they should be showing up by now?” he asked. Yet it’s unclear what the Federal Emergency Management Agency is doing on this front. The Tech Corps program was rolled into a program called the “Tech Sector Collaboration,” Michelle Ralston, a FEMA spokeswoman, said in a phone call Wednesday. That collaboration program is an effort through which tech companies, along with FEMA, would identify technology gaps that “can be matched with recognized organizations to build a national network of skilled technology volunteers,” a post on the FEMA website last updated in April 2016 states. The tech corps was initially started through memoranda of understanding between FEMA, which operates under the U.S. Department of Homeland Security, and “seven technology organizations to provide state, local, tribal and territorial governments with technology resources during a disaster to expedite response and recovery,” according to the 2015 release. The tech organizations listed include giants such as Cisco Systems, Google, Intel, and Microsoft. Leveraging the tech sector’s skills and resources on government response programs was of particular interest to U.S. Sen. Ron Wyden (D-OR). “Tech Corps harnesses a deep well of technical expertise and private-sector manpower to make sure every resource is available immediately when disaster strikes,” Wyden said in the 2015 release. Ralston, the FEMA spokeswoman, said the tech collaboration program is still functional; another FEMA spokeswoman had told me on Friday that the Tech Corps program no longer existed. But Ralston couldn’t provide more details as to what the program has done or is doing in the aftermath of the hurricanes that have hit the Gulf Coast, Florida, and the Caribbean. Some open questions: how much money, if any, has been committed, which technology companies are involved in any ongoing efforts, what projects are they working on, and how do these efforts interact with and support tech volunteers on the ground? Ralston said a FEMA private sector liaison would be the best person to address these questions but couldn’t say when that person would be available. Certainly, the big tech companies are leading their own relief efforts, such as Cisco’s Tactical Operations team, which is on the ground in affected areas; Microsoft’s donation of about $2.5 million in “cash, technology, and services” after Harvey; and an effort by Google to work with Florida officials to provide real-time updates on Google Maps on road closures during Hurricane Irma. Cameron Birge, humanitarian response manager at Microsoft Philanthropies, didn’t address the Tech Corps program specifically, but wrote in an e-mailed statement that Microsoft deploys “services disaster response” teams that provide emergency assistance, among other initiatives. “These teams help with the reestablishment of business operations and help government agencies and relief organizations use advanced data analysis and visualization to achieve their missions,” Birge wrote. [Updated with comment from Google.] Susan Cadrecha, a Google spokeswoman, said in an e-mailed statement Thursday evening that she “can confirm that we are not working with FEMA Tech Corps at this time.” Cisco and Twitter representatives have not yet responded to requests for comment sent through social media. Underwood said he’s hearing from some volunteers who, though they want to continue to help suffering communities, say they are beginning to feel the financial pinch. After all, hours spent volunteering means less time to devote to their own freelance businesses. Jeff Reichman, the founder of civic tech group Sketch City in Houston, which was one of the groups leading Harvey tech efforts, said he understands Underwood’s sentiment. “There is no infrastructure to be able to fund people who get involved in these projects,” he said. Reichman said the Entrepreneurs For Houston effort, a $10 million fund which was set up last month by Houston tech leaders, should help sustain Sketch City efforts. “A lot of that is going to be devoted to Sketch City program and developers for their work on the Harvey API, and also to fund and assist programs to do that globally,” he said. Still, more should be done to enable the continuity of knowledge created from disaster to disaster, he added. Last month, Underwood set up the Disaster Response Volunteer Corps, a website that can serve as an omnibus tool to streamline the intake of volunteers and their skills for use in a disaster anywhere in the world.